I am thrilled with how well my shift to recycled materials is going. In the past few weeks, I have worked with children from kindergarten to second grade. Starting with brown grocery bags and cereal boxes, we made a variety of books. It seemed even more fun than bookmaking with precut materials. What I love most is that the children can easily continue their enthusiasm by making books at home. 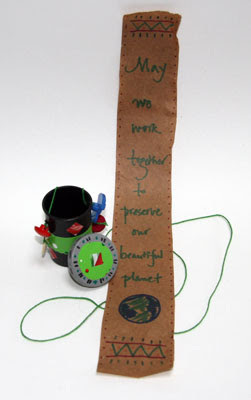 In this spirit of environmental awareness, this month's project is for Earth Day. Wish Scrolls are based on scrolls made in Ethiopia as talismans. My example uses a plastic film canister (I am thinking about a replacement for when everyone's camera is digital), old buttons instead of the beads, and brown paper bag for the scroll. I did use new crochet cotton but you could save old ribbon or string. I used a bookbinder's awl to make the holes so they are not that large but an ice pick or a regular awl would make a larger hole and give you more options for the thread. If you're doing the project with a large group, most places that develop film will give you canisters that they save for recycling. Earth Day was founded by Senator Gaylord Nelson of Wisconson in 1970. This site has some history, profiles of Nelson, Rachel Carson, and others, and a Teacher's Lounge with classroom actvities and a pdf of great quotes about conservation, wilderness, and nature. A friendly site created to encourage recycling and give basic facts and strategies to make it easy. Students of Tom Trusky at Boise State University in Idaho made protective scrolls based on ones from Ethiopia.